Source: Verne, J. (1870). Twenty Thousand Leagues Under the Sea. (F. P. Walter, Trans.). Paris, France: Hetzel. Talk spreads throughout Europe and America about the sighting of a huge sea creature. The public becomes concerned with a series of shipwrecks. The narrator introduces himself to the reader. Different theories are debated as to the cause of the recent shipwrecks. The narrator is invited to join an impending expedition. Aronnax feels compelled to hunt the monster. Aronnax meets Captain Farragut. Ned Land impresses the crew with his abilities. Fearing the loss of his ship, Farragut chooses not to attack until morning. Ned Land's harpooning of the creature fails to produce the desired result. Arronnax finds himself in a precarious situation. Aronnax, Conseil, and Ned Land have a close encounter with the creature. Part 1, Chapter 8: "Mobilis in Mobili"
The three men find themselves in strange, but hospitable surroundings. As the men discuss their situation, Ned Land continues to become more and more agitated. The commander of the vessel speaks with the captured men, and offers them some limited freedom. Aronnax is invited to eat with commander. Captain Nemo gives Aronnax a personal tour of the ship. Captain Nemo explains the various instruments and equipment throughout the Nautilus. Captain Nemo presents the blueprints of the Nautilus to Aronnax in the hopes of answering his questions further. The vast nature of the sea is discussed. Aronnax learns some unsettling information about Captain Nemo. Aronnax attempts to persuade Ned Land. The men have a debate about fish. Conseil continues to perform his domestic duties. Aronnax starts his diary. Aronnax, Land, and Conseil receive an invitation from Captain Nemo. The men commence their underwater hunt. The men reach the forest, where they encounter the various wildlife of the area. Aronnax returns to the Nautilus's platform. Captain Nemo discusses the personality of the sea. Aronnax and Conseil continue to witness amazing scenes from the inside of the Nautilus. As the Nautilus continues its travels into more populated areas, the underwater destruction continues to increase. The ship arrives at the island Vanikoro, where Aronnax and Captain Nemo discuss the the tale of La Pérouse's shipwreck. Conseil wishes Aronnax a Happy New Year before discussing their extended imprisonment. The Nautilus finds itself at the mercy of the tides. The men explore the island in hopes of finding some food not available on ship. Land finally gets a chance to hunt. Natives drive the men off the island then proceed towards the Nautilus. 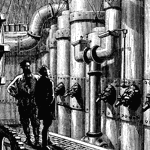 Captain Nemo discusses his many experiments with Aronnax. As the Nautilus approaches the shore, Captain Nemo becomes overwhelmed with anger. A distracted Captain Nemo asks Aronnax for some medical assistance. The men travel to the coral kingdom to bury the dead. As the second part of the voyage begins, Aronnax begins to believe to there is more to Captain Nemo than he originally thought. Aronnax encounters the Argonaut. Captain Nemo plans another excursion for the men. Captain Nemo and the men go pearl hunting. Land and Aronnax discuss the possible heading of the Nautilus. Captain Nemo and Aronnax discuss the dangers of the Red Sea. The men observe a strange creature. Land, Conseil, and Aronnax set out for another hunt. Land, Conseil, and Aronnax continue to discuss the possibility of escaping the Nautilus, although some are more enthusiastic than others. The men find escape from the Nautilus impossible under the current circumstances. Having arrived in the Atlantic, Ned Land decides it's finally time to escape. Aronnax explores the museum of the Nautilus. Captain Nemo and Aronnax discuss Spanish history. Aronnax recounts the previous nights events to Ned Land. Aronnax is asked to go on another excursion. In the coalmine, Captain Nemo and his crew search for fuel. The Sargasso Sea is explained in detail. Aronnax continues to ponder the possibility of freedom from the Nautilus. Ned Land, Conseil, and Aronnax attempt to size up the crew of the Nautilus. An unfortunate incident greatly affects Ned Land's attitude toward Captain Nemo. Once again the Nautilus finds itself at the mercy of the elements. Captain Nemo arrives at the South Pole. Conseil and Aronnax make their final observations of the remote area. Part 2, Chapter 15: Accident or Incident? The Nautilus's departure from the South Pole is not without incident. In order to avert tragedy, Captain Nemo takes drastic action. After surfacing, the men rush to catch their breath. Aronnax continues to document his observations. Captain Nemo's behavior changes dramatically after departing the American coast. The Nautilus and her crew encounter the giant squid. As the ship travels through the Gulf Stream, the men continue to wait for their opportunity to escape. Captain Nemo presents his manuscript to Aronnax. As the ship heads towards the English Channel, Captain Nemo shares the story of the Vengeur with Aronnax. An unfortunate Warship decides to engage the Nautilus. A still shaken Aronnax, is approached by Ned Land with another plan for escape. The crew of the Nautilus become increasingly upset. After ten months and twenty-thousand leagues, Aronnax reviews the written account of his adventures. Verne, Jules. Twenty Thousand Leagues Under the Sea. Lit2Go Edition. 1870. Web. <https://etc.usf.edu/lit2go/83/twenty-thousand-leagues-under-the-sea/>. April 19, 2019. Jules Verne, Twenty Thousand Leagues Under the Sea, Li2Go edition, (1870), accessed April 19, 2019, https://etc.usf.edu/lit2go/83/twenty-thousand-leagues-under-the-sea/.